Before we get to the shot by shot breakdown of how we made the piece there are a few key steps that hold true for every project. Once we have a tune selected and a fairly solid first pass on the script we will bust out our junky microphone and sing a pass directly into Final Cut Pro. We call it a scratch track because that’s what it sounds like – chicken scratch! Unfortunately we did not have a splitter for the headphones that would enable us both to hear the music so we snapped a pair of $2 Virgin America headphones in half and had to sing REALLY close to each other. (Good thing we’re brothers!) 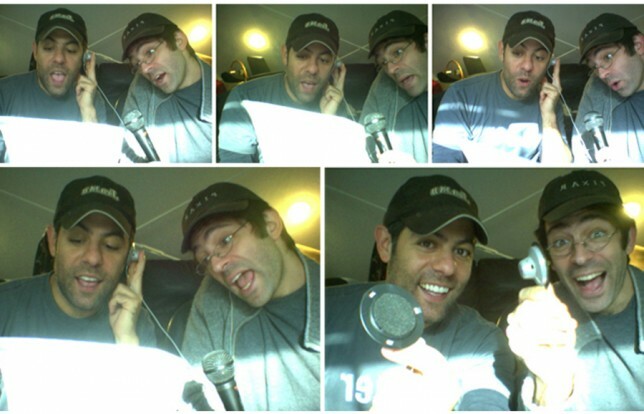 Here’s some webcam shots of the fiasco as well as an audio pass of the first. As usual, play it softly. Unfortunately neither of us inherited our mother’s singing voice! This entry was written by paulhanges and posted on December 27, 2009 at 4:41 pm and filed under 2009 Year in Review. Bookmark the permalink. Follow any comments here with the RSS feed for this post. Trackbacks are closed, but you can post a comment. The Entertainer by Scott Joplin. lol! at the end you sound like you were chocking on an apple!